Ever since the Bharatiya Janata Party (BJP) swept to power in 2014, it has battled criticism from the opposition and from independent activists of being biased against Dalits or SCs (scheduled castes). The protests following the death of the Hyderabad Central University student Rohith Vemula, those following the Saharanpur Dalit-Thakur clashes in Uttar Pradesh as well as those following the Una attacks in Gujarat have all relied on this narrative. The BJP on its part has argued that discrimination against Dalits has a long history, not necessarily connected to the BJP’s rise, and that it enjoys strong support from Dalits. The choice of Ram Nath Kovind as its nominee for the post of president was also aimed at burnishing its image as a party that offered adequate representation to Dalits. What does the data say? Which parties do Dalits support? And how far have they found representation in them? Data from National Election Studies (NES)—post-poll surveys of several thousand respondents across the country conducted by Lokniti, a research programme at the Delhi-based Centre for the Study of Developing Societies (CSDS)—show that over the past two decades, it is the Congress party which has enjoyed the greatest support among Dalit voters among national parties. From 1996 till 2009, the Congress always managed to get at least a quarter of Dalit votes. The Bahujan Samaj Party (BSP) typically was a close second to the Congress in these elections. The year 2014 seemed to mark a big shift in Dalit voting. The BJP gained nearly a quarter of Dalit votes, for the first time. The BJP’s Dalit vote share in 2014 was twice that of 2009 and 10 percentage points higher than its previous best in 1998. But what the data also reveals quite clearly is that like several other caste groups, the Dalit vote is fragmented, with smaller (non-national) parties taken together accounting for the largest chunk. In fact, even in 2014, the BJP’s gain in the Dalit vote share was at the cost of the Congress and the BSP, both of which saw a significant decline in their Dalit support base. The share of smaller parties increased marginally compared to the 2009 elections. One reason for the fragmentation in Dalit votes could be the divide along the lines of jati or sub-caste within the Dalit caste group. Even parties such as the BSP which claim to be Dalit parties effectively tend to represent the interests of Jatav voters, an influential Dalit jati. It seems the BJP has been successful in exploiting such divides to get the support of other sub-castes, for instance non-Jatav voters of Uttar Pradesh. The BJP’s strategy ahead of UP assembly elections was to focus on the upper castes, non-Yadav OBCs and non-Jatav Dalits, who comprise 55-60% of its population, according to poll strategists of the party. The BJP in its early days did not boast of many Dalit faces but this seems to have changed over time. As the party has become more prominent nationally, it has also been able to get more Dalit politicians in its fold. Data on the demographic composition of state assemblies from the mid-1970s to the mid-2000s—compiled and analysed by Fransesca Jensenius, a senior research fellow at the Norwegian Institute of International Affairs—shows that the BJP’s share in seats reserved for Dalits has grown over time. 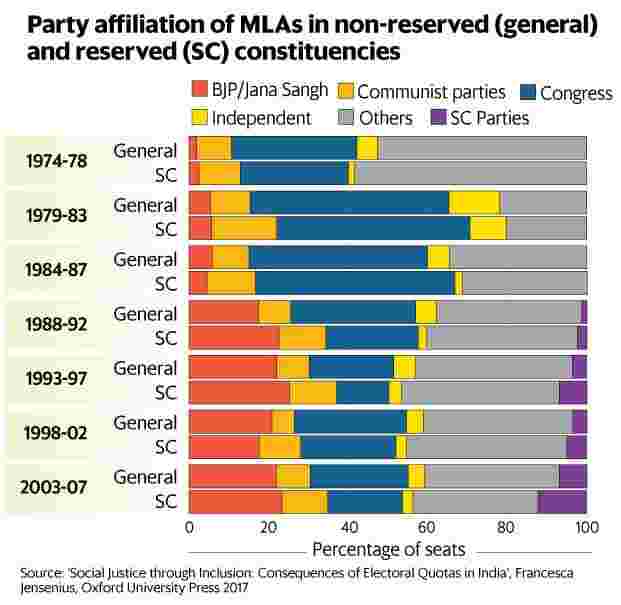 Jensenius, in her recently published book, Social Justice through Inclusion: Consequences of Electoral Quotas in India, shows that there is not much difference in party-wise results in SC-reserved and unreserved (general) assembly constituencies across election cycles. Parties that tend to do well on average tend to do well in reserved constituencies as well. This could be because candidates in SC-reserved constituencies have to draw support from a broad spectrum of voters, and not just their own community of voters, to get elected. Often, this is seen as weakening the impact of such quotas but Jensenius argues that the quota system has helped created a new Dalit political elite class that is integrated with the rest of the society, and has helped lower caste bias in the country over the long run. Once elected, are Dalits more likely to become ministers? In her book, Jensenius has calculated probabilities of Dalit and non-Dalit MLAs becoming ministers in state governments in two broad periods: 1977-92 and 1993-07. In both periods non-Dalits had a better chance of getting a cabinet position. Prior political experience—which is measured by rerunning rates—does not help the Dalits in bridging this gap. However, the data also shows that the relative disadvantage of Dalits on this count has declined in the years between 1993 and 2007 compared to earlier years. Jensenius’s work also shows that the chances of Dalits occupying high (cabinet rank) ministerial positions vary significantly across states. Surprisingly, Kerala and West Bengal—states where communist parties have been in power for a considerable period of time under consideration—have had much lower representation of Dalits in cabinets compared to other states. Wedged between West Bengal and Kerala is Tamil Nadu, a state famous for its anti-upper caste politics. Karnataka has had the highest share of Dalits in cabinets (as a proportion of Dalits elected to the state assembly) during the period under consideration. “This trend (of high Dalit representation in Karnataka’s cabinets) started in the 1970s, and continued with a very high number of SCs in the cabinet formed by the Janata Dal government that came to power in 1994 and the Congress party government that came to power in 1999," writes Jensenius. Although Ram Nath Kovind is not the first Dalit president, the BJP can rightfully claim credit for nominating a Dalit candidate when it was more or less certain of getting its nominee elected. It remains to be seen whether it can further consolidate its Dalit support base through such moves. An even bigger question is whether this new phase of Dalit politics would bring an end to the discrimination Dalits still face in getting political representation at various levels of government.